Last week we spent a few days at the southern Oregon coast, one part of the state we had yet to explore. Our family trip gave me the chance to visit a well-regarded brewpub that I hadn't yet been to, Block 15 Restaurant and Brewery in Corvallis. It's not completely unusual to see one of their beers on tap in Portland, but I was really looking forward to checking out Block 15 in person, to be able to sample from their full range of offerings. Ridgeback Red Ale: firm body, fruity malty flavor, decent hops. All the beers we tasted were really well done, there was nothing we turned our nose up at, and in fact we got seconds of the IPA. Brewer/owner Nick Arzner told me that they recently installed a brite tank for serving the IPA, and he thinks not jostling the beer into and out of a keg helps keep the hop aromas at their peak. I was hoping for a little more cherry flavor in the Cherry Quad, but it was a dandy Belgian. Pappy's Dark is a gem: drink it whenever you find it. There's so much to say about Block 15 as a brewery that I hardly know where to start. The place seems to be going several directions at once, and surprisingly, doing them all very well. For example, a lot of their best-known beers are giant, barrel-aged sippers like Pappy's Dark or Figgy Pudding, but on the other hand their cask ale setup meets the orthodoxy requirements of Ted Sobel at Brewers Union, so that Block 15 is -- as far as I know -- the only establishment where Ted will let another human being serve his wares. Meanwhile, in the basement of the brewery, a few different rooms hold various wine and whisky barrels for aging beer, while in another corner sits a custom koelschip for open-fermentation projects. Nick's brewing partner Steve van Rossem admits to a certain amount of nervousness about all the different critters they're using to ferment their beers, but he also keeps a tight handle on sanitation, which must be a big part of Block 15's success in producing such a varied lineup. The collaboration with OSU -- called Brewed by Beavers -- makes good sense for a brewpub in a college town where the local university has a fermentation science program. And in another kind of community outreach, Nick's Brewer's Brain blog is updated with pretty decent regularity, and has some really interesting content. This was a lunch visit, so I better say something about the food in the restaurant. It's not revolutionary -- a pretty straightforward Northwestern locavore menu -- but the whole family was happy with our burgers, fries, soups and salads. I certainly recommend it. 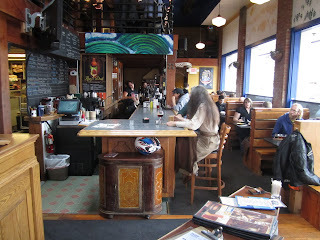 If you are in Corvallis, you're going to hit Block 15 for the beer anyway, so you might as well go with an appetite. 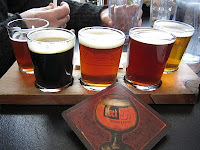 Finally, I should mention that Block 15 won last year's Cheers to Belgian Beers with their Ferme de Demons. Don't worry, we don't have to go to Corvallis for this year's festival, the surrogate site for it is Metalcraft Fabrication, 723 N. Tillamook, just off Interstate near Widmer and not far from a Yellow Line MAX stop. I hear that the big warehouse should be an excellent venue for the festival. Mark your calendars: April 30th, noon to 9 PM, with 42 (!) Oregon breweries lined up.